1 of 4 Heat oven to 350 degrees F. Coat a 13 x 9 x 2-inch baking dish with nonstick spray. 2 of 4 Heat 2 tablespoons butter in a large skillet. Add onion and celery; cook until softened, 5 minutes. 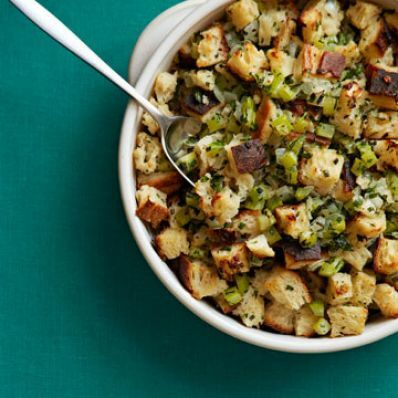 3 of 4 Mix toasted bread cubes, chopped sage, chopped parsley, salt and pepper in large bowl. Add onion mixture and 6 tbsp melted butter. Add chicken broth, a little at a time, tossing. Add only enough to moisten; too much will make stuffing mushy. 4 of 4 Bake at 350 degrees F in prepared dish, covered, 30 minutes. Uncover. Bake for 15 minutes or until browned. Per Serving: 243 kcal cal., 649 mg sodium, 2 g fiber, 7 g sat. fat, 31 mg chol., 13 g Fat, total, 27 g carb., 5 g pro.